A child narrates his illustration during The Picture Show. Several hands fly up in a room aglow with an overhead projector light and filled with the slight hum of the projector’s fan. 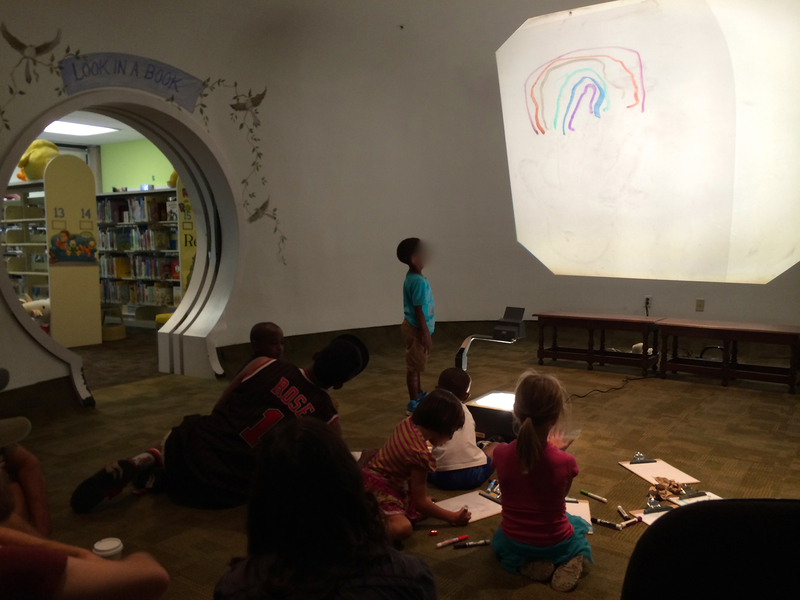 It’s a Saturday afternoon at the Chattanooga Public Library, and the storytime room is abuzz with children ages 3–12, sitting on the floor, clipboards in hands, drawing on overhead transparencies with dry-erase markers. I select one of the raised hands, and that child makes his way to the front of the room, where I sit on the floor next to an overhead projector. When the child approaches, I ask his name and then announce to the room, “May I have your attention, please. Jeremy has a story he would like to share.” I place the illustration Jeremy drew moments ago on the overhead projector, illuminating it on the wall for all to see. The audience quiets, and the child starts his story. The concept of The Picture Show as a library program came from watching the show Tumble Leaf with my five-year-old daughter. At the end of episode 4 in season 1, the main character, Fig, shares stories with his friends by narrating pictures he drew using a firefly projector. Ever since watching this episode with my daughter, I had mulled over how to bring this concept to life in a library setting. The Picture Show experiment was born. After months of experimentation, we found that the concept can easily be applied in any public or school library as an open-ended way to enhance a young person’s literacy development through artistic expression. “My picture is about me, and I was outside looking at the sky and I was wishing I could fly…” The children and adults in the room gaze up at the projection of the boy’s illustration on the wall as he points to various images in his picture and conjures a story within minutes about the picture he’s created. Some kids watch, and some work on their own pictures while they listen. When Jeremy finishes, I thank him for sharing his story at The Picture Show, and the whole room claps. He smiles and sits down while other hands shoot up. 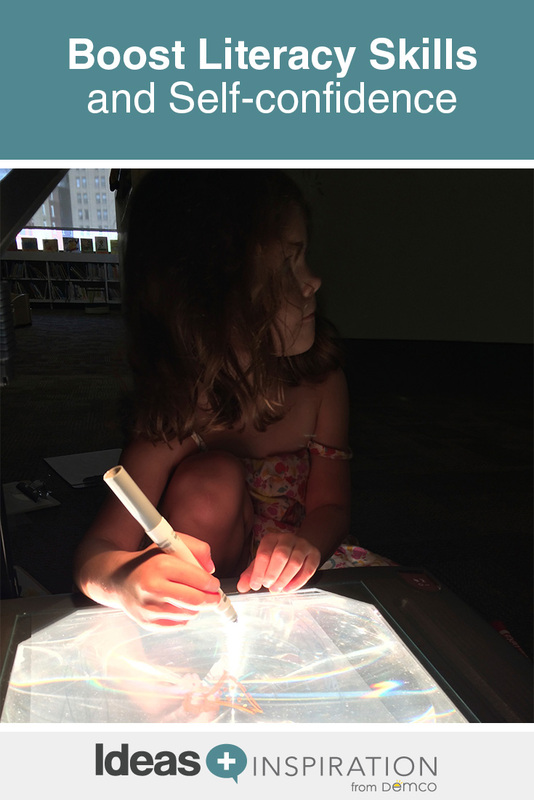 At the overhead projector, a child becomes the storyteller. Typically, librarians are the storytellers during storytime. The Picture Show is a complete role reversal, offering the stage up to the kids. Taking a backseat as a facilitator has multiple positive effects, including promoting language development, both written and oral, and creating an engaging and enchanting place for kids to be creative while being themselves. Unstructured time for artistic expression has so many measurable and immeasurable benefits, from exercising language and literacy development to boosting a young person’s confidence. Creating The Picture Show requires little preparation and few materials. 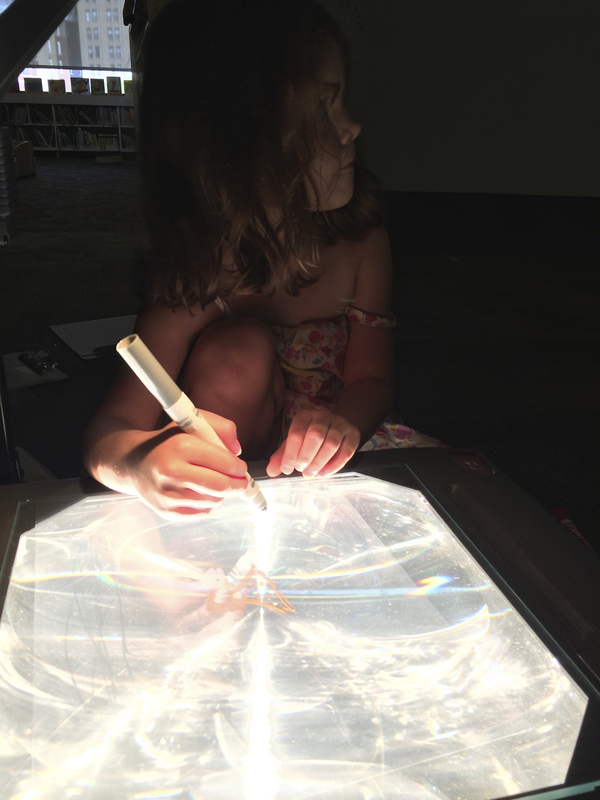 I use an overhead projector that had been collecting dust in a supply closet, colorful dry-erase markers and clipboards with clear overhead transparencies and a white sheet of paper underneath so children can see what they are drawing. To make the setting more intimate, I arrange the clipboards and overhead projector on the floor, so that we are all on the same level. When the time comes for The Picture Show to start, I welcome everyone, explain the one rule (treating each other with respect), and then invite participants to draw a picture on an overhead transparency attached to one of the clipboards provided. 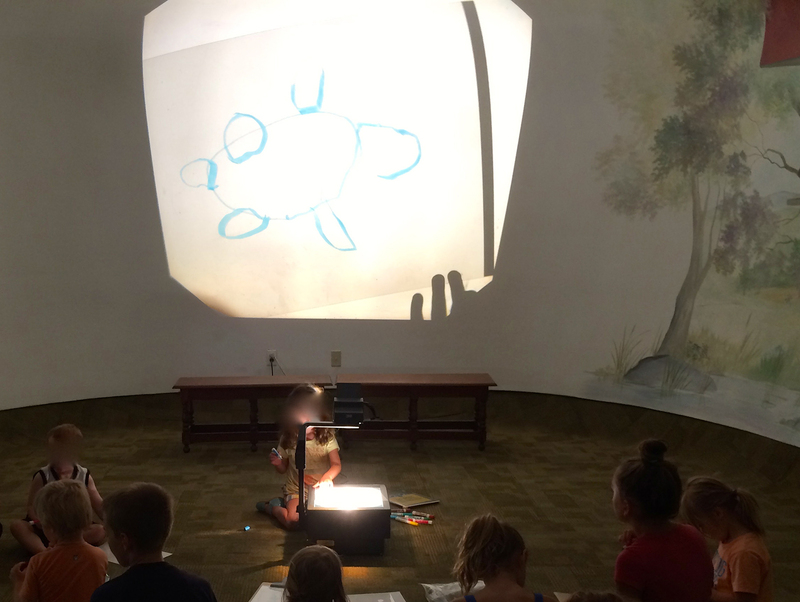 As children finish their drawings, we take turns presenting them to the group on the overhead projector. I find it helpful to start with my own picture story to demonstrate the objective, but I don’t like to do that often, as children tend to mirror my story elements and are less inclined to stray toward original content of their own. When a child finishes drawing her picture story, she raises a hand and begins her tale after being called to the front—and the stories flow. After each and every story, I make a point of thanking the storyteller for sharing the story with the audience, and we all eagerly applaud the storyteller. This is an extremely important element in the success of the Picture Show because it reassures all children of their abilities, shows the support of their peers and encourages them to continue their creative efforts. The Picture Show has one rule that is clearly communicated at the beginning of the show. I take a moment to welcome participants and clearly state that in the Picture Show, you must be respectful to those presenting their stories. I allow participants to work on their drawings while someone is speaking, but otherwise this is a firm rule. The participants are very good about being mindful of one another. There are no other rules for The Picture Show; the fewer the restrictions, the better. The Picture Show is an opportunity for children to share their stories in whatever capacity that may entail. If a child does not wish to tell a story but does want to share a picture, that is A-OK. The Picture Show is meant to be a space of creative expression at one’s own pace. 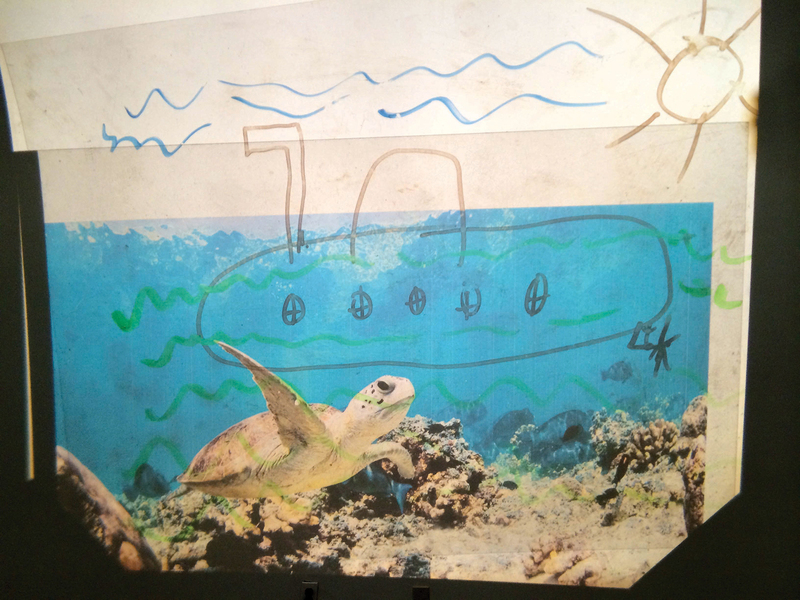 Overhead transparencies set the scene and inspire children to start inventing stories. Often I find that printing an image of a scene onto an overhead transparency is an effective kick-start that inspires the kids. I encourage the participants to draw characters or objects for that scene. 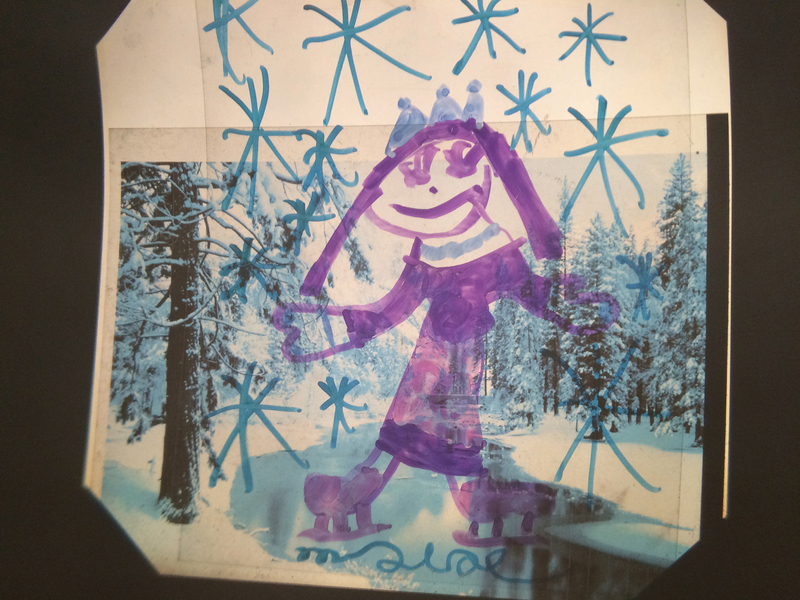 For example, when I laid a transparency of a snowy forest scene on the overhead projector, a few of the picture stories created for that scene included an abominable snowman who wanted a vacation, a magical fairy ballerina ice-skater, a fox who loved to wear mittens and several accounts of Elsa the Snow Queen. What is the bird’s name? Where are the people going? Have you witnessed a scene like this before in real life? What is the puppy planning to do next? Tell me a little more about why you drew this picture. If they are less eager to share, I take cues from their behavior and don’t force it. Also, if they don’t wish to speak at all, I don’t push them. At the same time, the kids who are a little less confident in sharing their picture stories open up over time or find confidence in recreating the picture and/or the story of another child. The goal is to guide them but leave them in control. Another way to instigate stories is to play music. At the start of The Picture Show, I often play a song while the kids draw. They can depict a story inspired by the song if they choose, and oftentimes they do. After everyone is finished sharing their picture stories, I play the song again and quickly cycle through each of the illustrations as a grand finale. Looking for another way to spark storytelling? Invite students to draw while telling their story. For example, I shared Ed Emberley’s story Go Away, Big Green Monster! by drawing the monster’s features onto the projector as I read the book aloud, and then I erased the features as they went away in the book. A young storyteller gains confidence as her story evolves. To my surprise, very early on some stories took darker turns than I had expected. I had to quickly adapt to appropriately deal with those situations. The Picture Show is about providing a platform for expression, and for some that means story and art as a form of catharsis and communication about very real and deep issues. Some sessions are carefree and silly, but others are a completely different mood entirely. The willingness these young people show to expose themselves, even subtly, is amazing and important. Equally amazing is how the separate stories start to blend together as participants riff off of one another. The stories all start to claim one or two themes during a particular session, and a form of group therapy emerges. Children recognize that what they are sharing is being heard and others are willing to bring the good and the bad from someone else’s story into their own stories. If you decide to recreate The Picture Show in your own library, I encourage you to document the stories and pictures in an easy way so you can track each student’s progress. If students are comfortable with it, you can make an audio recording of each story. Kids will love listening to the playback and you’ll be able to document their growth. The Picture Show serves as an exercise in visual literacy and language development in both written and oral forms. Oral narrative teaches flexible speaking and listening skills and promotes language development and communication skills through the interactive art of storytelling. Also, through sharing stories over time, individuals gain more and more verbal confidence in presenting their stories to the group. Rebecca is a 2013 Library Journal Mover & Shaker and a contributor to the Library as Incubator Project with her popular series, Pages to Projects. She has created high-impact programs that have reached thousands of children. For more, visit her blog, Sturdy for Common Things.